so said ellie: A Pronouncement. I've been thinking about this for some time,* or at least, it's very early and I feel slightly psychotic because I'm usually not awake for about 3 more hours....where was I..? Yes: I have come to a conclusion, and am ready to issue A Pronouncement. Even though I have sort of issued it previously, never mind. 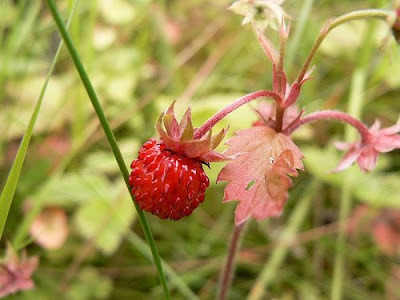 You have never really tasted a strawberry unless you have roamed in mountain woodland sunshine, and plucked it yourself, fresh, from its mossy nest. *For you see, the reason I have been thinking of such things is because in a month we are going on holiday in Europe! And I have been thinking of all the lovely things I plan to eat. Many lovely things made of sweet pastry and sharp cheese. Oh my. I'm a little overwhelmed.